Is it just me or have your allergies been exceptionally bad this year? Oh my. Last week I suffered so horribly from allergies I just knew I was going to get a sinus infection. The Cedar trees in my backyard are bright orange, which I should love considering I love all things Orange, but in this case, orange equals pollen which equals severe I-think-I-might-actually-die-because-my-head-is-going-to-explode sneeze-a-thons. 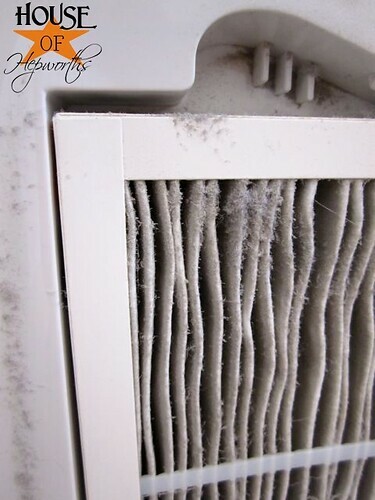 After several days of itchy I-think-I-have-pink-eye eyes it dawned on me that I should check the air filter in my Filtrete Clean Air Purifier (which is one of the best investments I ever purchased two years ago). 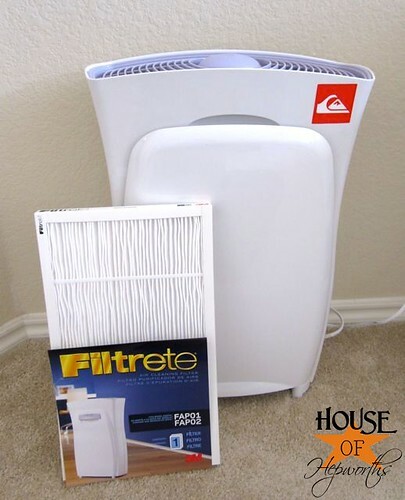 Here’s my beautiful Filtrete purifier with a brand new filter next to it. Now, before I go into details, the package on the filters says to change it every 90 days. BUT, being the smarty pants that I am, I drag out their life expectancy to 4-6 months by vacuuming the dust off of them after about 3 months, which may or may not be the best idea. The verdict’s still out on that one. Anyway, I put this filter in the day we moved in. It was actually the very first box I insisted on opening. I WILL NOT sleep without this purifier on. When I sleep without it at say, a hotel or somewhere, I wake up with huge amounts of thick gummy gross stuff that I’d rather not mention on my blog coming out of my nose. And the most horrible sore throat. And itchy eyes. But honest-to-God (and I’m NOT being endorsed in any way shape or form by 3M), this purifier has changed my life. And I sing to it I love it so much. “Because I knew you, I have been changed for Good. And just to clear the air…” (sorry, I couldn’t resist the pun). Ewwww. Ewww. Ewww. And I even vacuumed this one about a month and a half ago. If you are skeptical about whether purifiers work or not, let’s just be clear here. Filtrete DOES. It works very well. It works so well in fact that I won’t buy one for my family room because it zaps everything out of the air. Including my favorite Bath and Body Works candle scents. Everything. 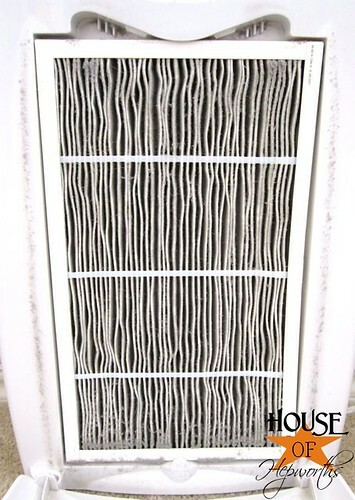 The filters are not cheap, but so worth it if you want clean air. 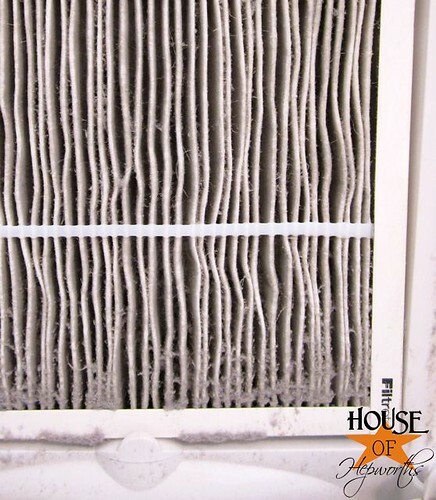 I installed the Filtrete air filters in my A/C unit as well. Love them. And just in case you think the filter isn’t really *that* bad, check this out. The new and the old. Mmmm Hmmm. Yup. Totally disgusting. I know. But fortunately all that crap went into the filter and not my LUNGS! Thanks to changing the filter out (and the rain that washed a lot of pollen out of the air) I’m already sleeping better at night. I still can’t believe how much stuff we breath into our lungs daily. I’m surprised the entire world doesn’t have lung cancer. Yuck! But at least I know my bedroom is cleaner. Oh, and one more fun fact. When I wake up in the morning, I can breath well and am fine. The second I stagger out of my room (away from my air purifier) the sneezing starts. And I don’t just sneeze once. I sneeze like 15 times in a row. Short little high-pitched annoying sneezes. I’m embarrassed when I sneeze in public because after the first “ach-ooo” some stranger will say “Bless You!” (I am in Texas, home of the friendly, remember?!?) and then I’m all sneezing 26 more times before they even get to the word “you”. It’s this totally awkward exchange where they are trying to bless me, and I won’t stop sneezing, and they say “Bless y…” about 5 times while I keep cutting them off with the sneeze. Meanwhile I’m running away from them because I’ve just peed my pants. In public. But they just think I’m rude for running away from them while they are just being a good ol’ friendly Texan. So anyway, I hate allergy season. And I love my air purifier. And I should quit my day job (oh wait, I don’t have one) and go be in Sales at 3M because I’d totally rock it with the Filtrete. That is, if I could get through a pitch without racing to the potty. What do you do to curb the allergies this time of year? I need more tips! In addition to the purifier, I take Allegra twice a day – one in the morning & another before bed (which I’m not even sure I’m suppose to do since the prescription says take once daily), and I use the NeilMed Sinus Rinse (which has single-handily caused me to not have a sinus infection in 3 years (and I usually get at least one a year). So, again, may I ask, what do you do to curb the allergies this time of year? « Modern Bird winner & say hello to ModTots! You are hilarious!! Have you heard of a ‘netti pot” I haven’t personally tried it but I have a friend that uses one and swears by it (especially when preggers and you can’t take anything) I’m not sure how much it would do for allergies but worth the research. 🙂 I enjoy your blog soooo much! Here’s to kegels!! That blog post cracked me up. I’m not laughing at you, but with you. I suffered for a long time with sinus issues and finally had sinus surgery. It helped but I still suffer from some of your issues. Living in Tennessee is even worse than Texas for those problems. I have also lived in Texas so I can say that. I would also suggest a plain old saline nasal spray. I kicked the Allegra/Flonase habit and I have try to only take Sudafed PE and some saline spray only when I feel I need it. It’s way cheaper and it does really help. I also wonder if it would help you to run a humidifier, but that may not jive with your filter. Good luck with all that. ZYRTEC. I live in Texas too, and not that far from you in San Antonio. The Mountain Cedar is HORRIBLE this year! The only way I can stay sane is to take 24 hour zyrtec every night before bed. I am breathe all day. It is a little more expensive than claritin, but it works SO much better! i am cracking up laughing! great way to start my day! good luck with the alergies!! Thank you for that laugh. It has truly been a mundane day here at work. neti pot and Zyrtec D, Mucinex BID. otherwise i’m so stuffy and sneezing i’m nearly nonfunctional. i had sinus surgery in mid 09 which helped tremendously with my chronic sinus infections. 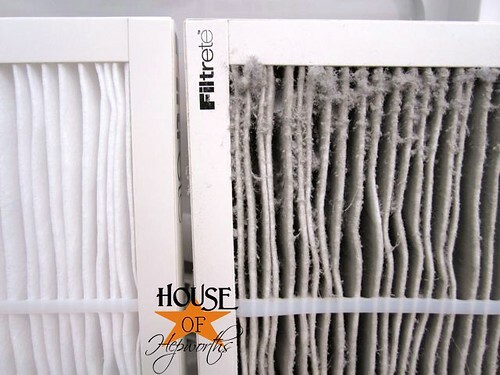 we use the Filtrete filters too in our house system. 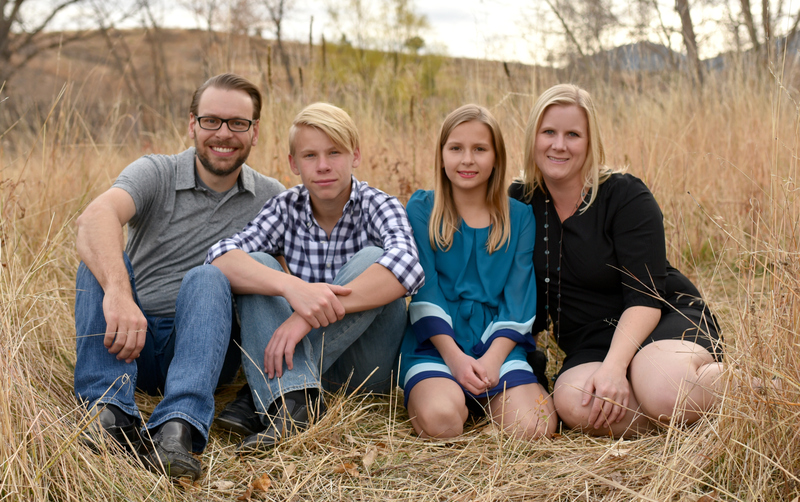 our son seems to have inherited my allergies (daughter is unfazed by the pollen, cedar, etc) and he gets a kids 24hr Claritin, Zyrtec seems to do nothing for him. At least I’m not the only one who has issues with sneezing 5000000 times in a row and peeing! The worst thing… having allergies and being 8 months pregnant. No, scratch that, having allergies, being 8 months pregnant and having a trail of laughter from your husband and toddler following you after you sneeze while you run to the bathroom trying to hold on to any ounce of dignity you may have. Well, everything up here in Nebraska is still dead as doornails (and it’s still snowing), so I don’t have to worry about allergies just yet. Found you via Bonnie @ House of Grace. I’m a new lover of Shaklee! I live in the desert of Arizona and when I moved to this region from the mountains of Arizona, I suffered terrible allergies. The NeilMed saved me! 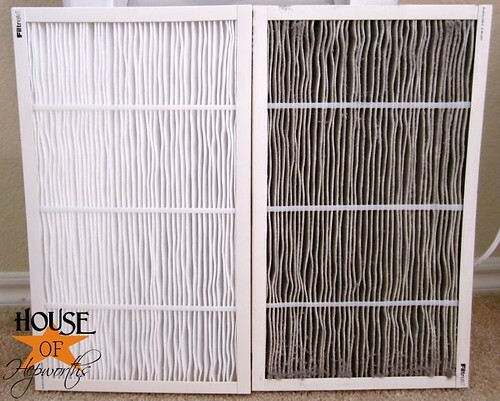 About your air purifier- does it remove the smell of your fave candle? I could not bear to have the smell of my scentsy zapped! 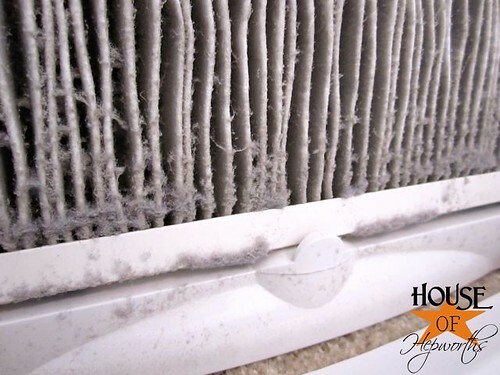 do you have an air purifier in you bedroom & one in your family room? Or do you move it around? I use an air purifier as well!! My nose runs constantly…all year long! I should buy stock in Kleenex!! Ha! Ewwww, that filter is narrrsty! Looks like it works great, lol. I wonder if something like this would help my hubby in the spring/early summer. Right now, all the trees are dead and everything’s covered in snow, so no allergies for us at the moment! So, you mentioned that the Filtrete Air Purifier even zaps smells out of the air? You referenced good smells, but I assume that means that it works on bad ones as well? I have three dogs, and while I love them, I could definitely live without their stink. I also am a longtime sufferer of allergies. I also sneeze a gazillion times in a row and I wish people would wait until I am done and not say bless you 20 times. I use a neti pot, 24 hour Zyrtec 2 x’s a day and plenty of good quality tissues. I used to get allergy shots until we no longer had health insurance but it was good while it lasted. I unfortunately had to resort to steroid shots.. 3 in one year. That was 2 years ago and I am still regretting it because of the 10 pounds per shot! ouch. I have also been addicted to nose spray and it took me 4 months to become a new normal, it is something I will never do again. My hubs and I are looking into air purifiers but have only started our search. I wish you well my sneezy friend… God Bless You times a billion! I can relate! I used to be the same way – used all the tissue in the house and started on the rolls of toilet paper! Here is GA the pollen is visibly covering everything in yellow every spring. I chose the natural remedies and I rarely get symptoms anymore – if I start to sniffle I start the regimen again it it stops the next day.